One of my favorite things to eat back home in San Antonio is Salsa. If you go to any Mexican restaurant in San Antonio you get a free bowl of salsa and chips to munch on, strangely enough, even at breakfast time. Anyways, It’s always so good, and always homemade. At the grocery store back home, the Salsa aisle is kind of insane. There seem to be 100 different kinds, and every jar claims to be award winning or the best, but actually it’s very very difficult to find one that tastes good. I always try one and end up being disappointed. 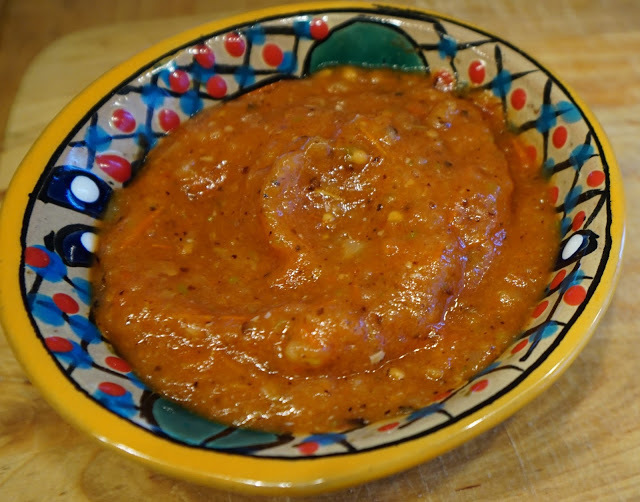 The best ones are usually the freshly made Salsas in the refrigerated section. H.E.B. makes a really good fresh salsa btw. Yesterday I decided to try to make Roasted Salsa. Surprisingly it was so easy to make, and tastes so much like the roasted salsa I love at Salsalitos restaurant in San Antonio. I found the recipe online here and I made a video which you can see below. Chop 1/2 a medium onion into four chunks, set aside. Remove the pan/dish from the oven, and place the tomatoes (skin side down), jalapeno, garlic cloves (skin on), and onion on the pan/dish. Sprinkle salt evenly on the tomatoes. Turn on the broiler in the oven, and place the pan/dish in the oven for about 10 minutes. Then, turn over all of the ingredients, and broil for another 7 - 10 minutes or until toasted. Remove pan/dish from the oven and let cool for about 10 minutes. Then, add the tomatoes and onion to a food chopper. Next, remove the stem, and seeds from the jalapeno, and roughly chop it into a few chunks, and add it to the food chopper. Finally, remove the skin from the garlic cloves, and chop off the end piece, and add the garlic to the chopper. Pulse everything until well mixed, then stir in the lime juice. Add more salt, if needed. I used a grill pan in the oven, but you could use an oven safe frying pan or a baking dish. Alternatively you could try to toast the vegetables on the stove top on a high heat, although I haven't tried that. The original recipe calls for cilantro and sugar. I did not add this to my recipe, and it tasted great, but you can add that if you wish.